Carinn; carerynn | Malaysia Fashion, Beauty & Lifestyle Blog: Beauty: Christmas Wishlist Granted! Who says Santa doesn't exist? I know this post is way overdue as Christmas is over. I myself didn't know my wish was granted until after Christmas because when the postman delivered my parcel on Christmas afternoon, I wasn't home so I had to wait till last Wednesday for my dad to go collect my parcel from the post office. 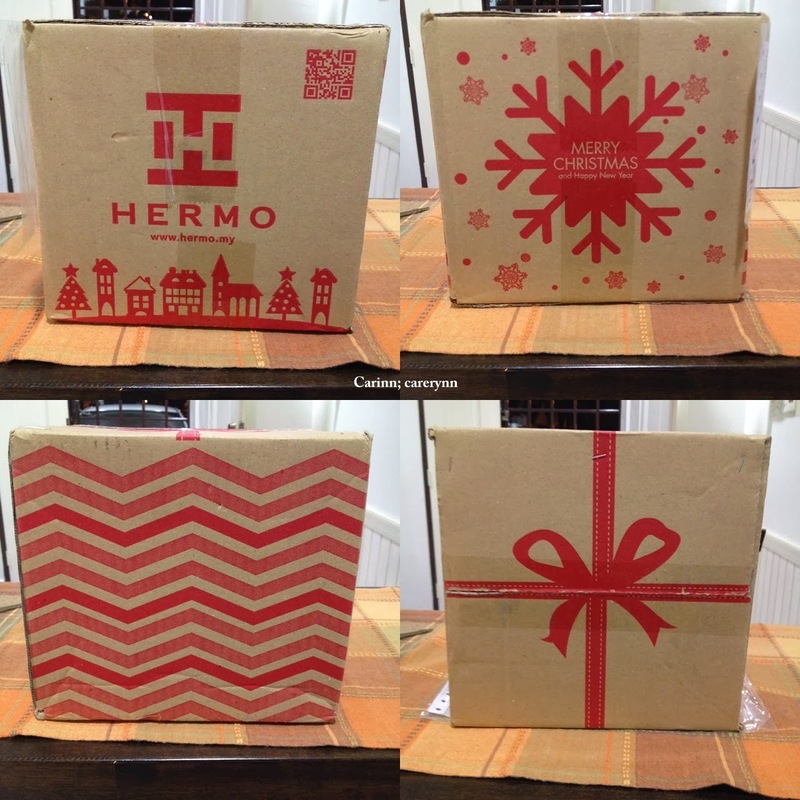 Imagine my amazement when he brought home a big beautiful box... From Hermo! In case you have not read it, this was my wishlist to Santa Hermo last December. It was a meaningful collaboration between Hermo x The Butterfly Project Malaysia to grant bloggers' wishes in conjunction with Christmas. Why am I telling you this? Because when my dad brought my parcel home last week, I expected it to contain my newly purchased items. Seeing as Hermo was always so efficient, I thought they did send me my parcel on Christmas itself! I saw so many bloggers posting that they had their wishes granted and I was like, "Okay, I did not get my wish granted but it's alright! It'll still be a happy Christmas!" When I opened it, it was chock full of newspaper. My items were riggghhhtt at the bottom of the box. Nicely and safely wrapped in bubble wrap so that the items will not be damaged. From the outside, I can see that there's one 3CE box and a pink tub. But wait, I bought TWO 3CE, not one?? Somehow, Hermo could read my mind cos they sent me the concealer in shade #001 which is just right for my skin colour. You can get the 3 Concept Eyes Waterful Concealer here. The tub for the balm had a layer of plastic packaged around it but I removed it before I took the photo. It is said to be super moisturising and you can use it anywhere; on your face, lips, hands and I've even applied it on my cracked heel. You can get the Naruko Rosehip Perfecting Elixir Multifunction Balm here. Once again, thank you Hermo for making me very happy. I am really grateful and this has encouraged me to blog more. Stalking the website everyday makes me happy, but receiving a gift from them made me even happier. :D Not forgetting The Butterfly Project for having awesome collaborations that allows us bloggers to gain more exposure and learn about new brands & companies! Check out Hermo.my for all your shopping needs for beauty products! Hermo carries authentic products from various brands all over the world at affordable prices. What's more, they provide free international shipping for 2 items and above and you can get 14 day refunds with no questions asked. If you're lucky, you might even get a free gift with your purchase! They constantly have promotions on their website and there is a credit system where you can convert your credit points into $$$ for future use. So make sure you actively stalk them everyday so you don't miss out on good deals! Don't forget to check out the best blogger community too! I'm currently using this 3CE concealer too, so far it has not disappoint me yet (: Congrats on winning btw!